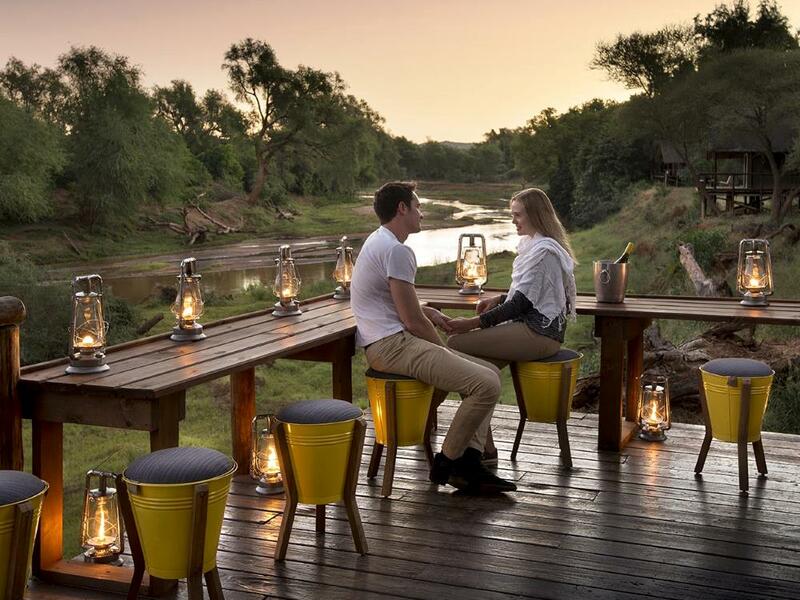 You need hardly leave the camp - the tented suites and main decks of Pafuri sit right on the bank of the Luvuvhu – you’ll enjoy stunning views of elephant and buffalo coming down to slake their thirst and graze in the riverbed! The best bird watching in the country bar none – if your ambition is to tick off the near mythical Pel’s Fishing Owl and countless others then you’ve come to the right place! The far north of the Kruger is not renowned for producing big cat sightings as frequently as the southern region, so this is probably not the best choice for first-time safari-goers wanting to tick off their full list of the Big Five - that said there are quite a few leopard around the camp and we were lucky enough to get sightings just outside the camp on 2 successive nights! After being all but washed away by the raging floodwaters of the Luvuvhu River back in January 2013, it looked as though Pafuri may have been lost for ever. 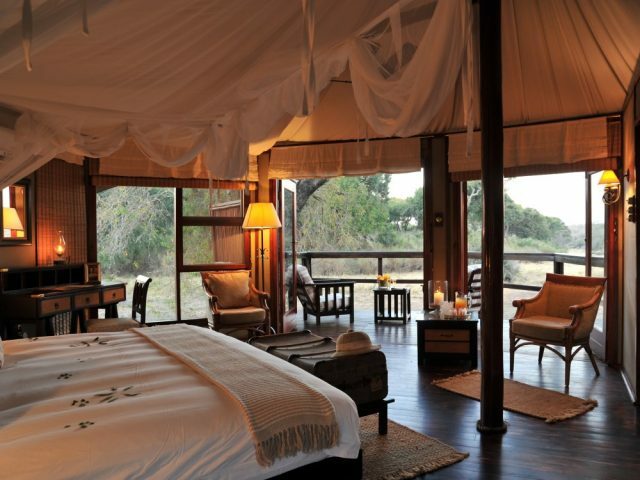 Previous operated by Wilderness Safaris, the camp re-opened in 2016 under the auspices of ReturnAfrica - and the good news is that this old favourite has returned better than ever! Lying deep within the Makuleke Concession in the far North-east of the Kruger National Park, Pafuri camp has been rebuilt in exactly the same spot on the shaded banks of the Luvuvhu – we all just have to hope that the next “once in a 100 years” flood takes another century to arrive and the camp is left in peace till then! 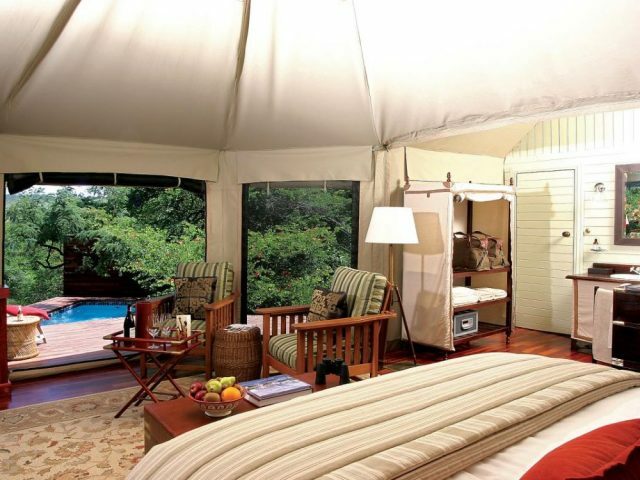 There are 19 designer tents in total (7 of which are family tents, so the lodge can take 52 guests in all), all of them perched on the river bank sheltered by enormous Jackalberry, Nyalaberry and African Mahoganies from where they enjoy stunning views out over the Luvuvhu river. Whilst 19 tents makes for a pretty big camp, the good news is that the tents are separated an ample distance (about 30 or 40 metres between them)and screened by vegetation from each other, so your privacy is still maintained. If you struggle with mobility though, you’re advised to request a tent close to the public areas as the walk to the furthest tents is quite a trek given the camp is pretty sprawled out along the riverbank. Reached via raised wooden walkways, the rooms have been painstakingly recreated to capture the beauty and style that made Pafuri such a favourite before the flood struck. A mix between a tent and a fixed wooden structure, these simple canvas abodes sit under natural thatch roofing (keeping them cool during the heat of the day) and employ an open-plan design that lets the air and light flood through, blurring the division between bush and room. Bright and crisp white linen are enlivened by lovely green fabrics to give an extremely elegant and classy feel to the rooms. The Family Tents add an additional section onto the back of the standard tent structure containing 2 single beds which are perfect for kids. 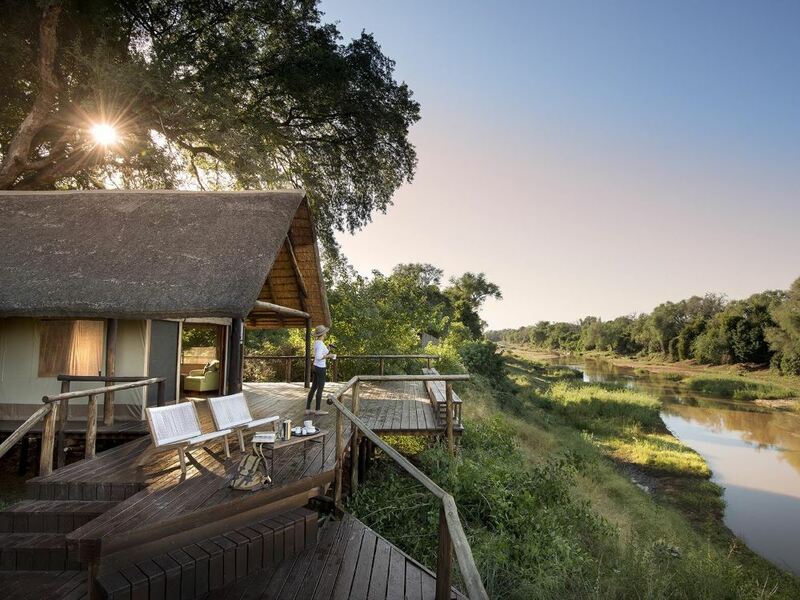 A private deck complete with chairs is the perfect spot to while away the hours with a good book whilst you watch nyala daintily grazing in the undergrowth or the elephants and buffalo which regularly come down to slake their thirst and cavort in the river! We loved the public areas over at the main lodge, where there’re plenty of places to make yourself comfortable in the lounge or on one of the decks which all enjoy stunning views out over the river with a constant parade of animals to be seen. Given the high temperatures often experienced in this neck of the woods, the swimming pool is a place you’re likely to spend a lot of time around (or more likely “in” as you seek some relief from the heat!) Otherwise the quirkily rustic but funky bar is the perfect spot to order something long, wet and very cold whilst watching the animals in the riverbed! Obviously, being a relatively large camp, you don’t get the intimacy of smaller lodges but the good news is that you're always able to find a quiet spot to chill out - we especially loved the shaded double day beds next to the pool! 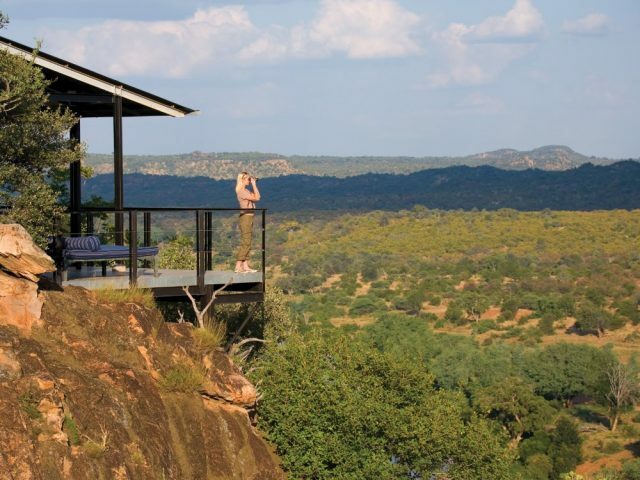 By far the biggest attraction to Pafuri Camp is the stunning scenery to be found here which makes it unquestionably the most beautiful region in the famous park! That’s not to say there isn’t reasonable game viewing to be had here, but it’s probably fair to say that this isn’t a prime area for big game and first time safari-goers who’ve never seen a big cat before are perhaps better advised to visit one of the southern lodges. But for bush aficionados the far norther Kruger holds a multitude of treasures: the massive fever tree forest nearby the camp is a prime example, as is the legendary “Crook’s Corner”, the meeting point of South Africa, Zimbabwe and Mozambique, and a favourite place to enjoy a couple of sundowners at the scenic spot where the Limpopo and Luvuvhu rivers meet. It’s a breath-taking place to watch the day slowly burn away in an array of golds and reds. Another never-to-be-forgotten experience in the western section of the concession is the famous Lanner Gorge where the Luvuvhu has carved out a spectacular canyon of sheer cliffs. Pafuri’s rangers and trackers know the concession like the back of their hands, and though not noted as a prime game viewing region, it is known for producing superb sightings of big herds of elephant and buffalo, particularly in the drier winter months when they are attracted to the waters of the Luvuvhu and Limpopo. And whilst this the concession isn’t Big Cat Central, leopards are often seen in close vicinity to the camp. You don’t even have to leave the lodge to enjoy great game viewing: with its waterfront position, many of the animals we’re always keen to cross off our ‘Must See’ lists – from elusive leopards to majestic herds of elephants and buffalo – make their own way literally to your doorstep for a drink! In fact when we stayed here we saw more game whilst relaxing on the deck than when out on drive, so don't feel guilty if you just feel like chilling with a drink watching the animals in the river bed! Whilst the Pafuri area might not be the best area for big game viewing, what it does deliver without question is some of the best birding in the sub-continent, particularly during the summer months when a host of migrants arrive in the area. Of course the big one for most twitchers has to be the famous Pel’s Fishing Owl and you only have to read the guest reviews to see that this special is regularly seen, often from the comfort of the lodge itself in fact. Despite (or perhaps because of) the near demise of Pafuri Camp, the quality of service is at an all-time high. The entire team here – from rangers to bartenders and chefs - have thrown themselves with real enthusiasm into ensuring lucky guests leave having had a totally unforgettable experience!